mill green | what? bread? On Tuesday this week I took my son to Mill Green water-mill in Hatfield. There isn’t a whole lot to see there apart from the mill itself, and some small displays of Hatfield history. The miller was great, and talked a lot about how the flour is made and how the mill itself works. There’s a couple of hands-on milling exhibits for small people to use up some energy on. And to my slight surprise my son was actually rather impressed by the whole thing, the size of the mill, the water power, how hard it was to grind flour by hand. He spent quite a long time grinding about a big tablespoon of flour from some wheat grains they had there. So I think he learned something. Being a bit of a smarty pants he commented on some other children who came later who didn’t read the direction the stones had to go in and were therefore doing it wrong. 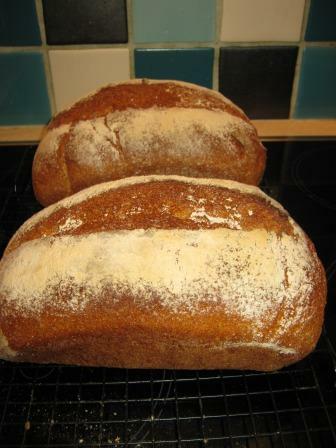 We bought some flour and today I baked a couple of wholemeal loaves with it. I wish this was smellyvision because they actually smell like roasted wheat. So if you’re down that way, do drop in, they are open Tuesdays, Wednesday, Thursdays and Sundays, which is twice as much as nearby Redbournbury, as featured by Paul Hollywood, which opens only at the weekends. The more cunning of you could get both flours and do a compare and contrast. We had to go Tuesday as it was the only chance this week, but I’ll definitely try to hit both one weekend soon. Coffee and ricotta marbled cake in the oven which I realise I haven’t made for nearly a year. Can’t wait to try both the bread and the cake!